What was I saying on Monday about “ho-hum” days? There’s actually no such thing. SOMETHING is always happening. 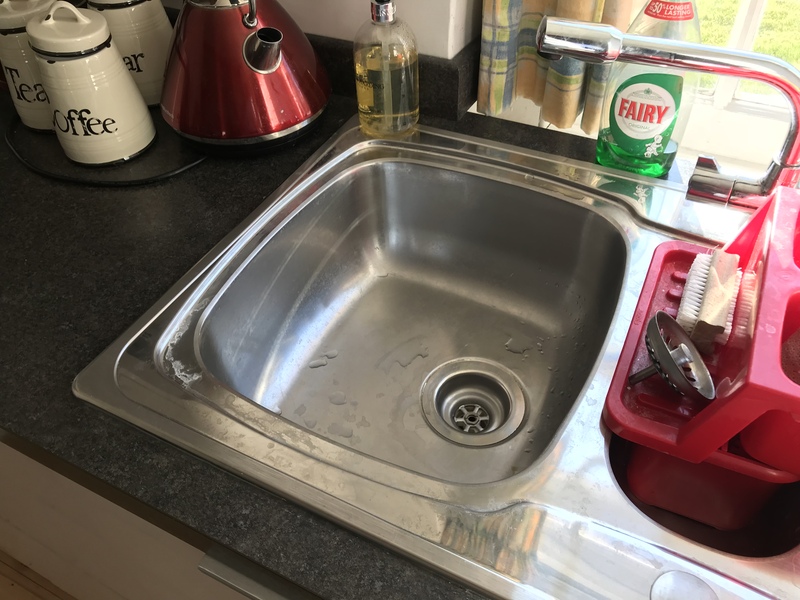 On Tuesday morning, we notice that the kitchen sink isn’t draining away. I seek to clear it initially using a bit of bleach and hot water. But that doesn’t work. Hmm. We have a mountain house miles from civilization in the Catskills; I know how to do bits of this and that, I smugly think. I suspect any clog could be in the first U-bend in the pipes. I unscrew it and – well-prepared – in a pre-placed bucket I catch the water as it rushes down from the sink. And I decide I need a coffee. I refill the sink and again consider where the clog may be. 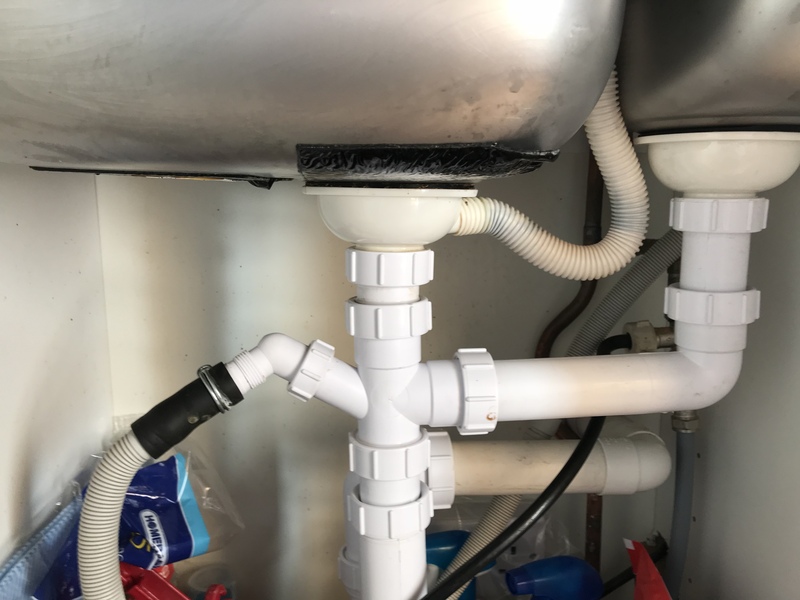 Moments later I notice water is seeping down from the sink around the underside seam of the drain plug and running along the piping into the cabinet below. Quickly I pull out all the stuff we all store under a kitchen sink. I must have accidentally loosened the drain fitting when I uncoupled the bend in the pipe! Damn it! Having cleared the cabinet, sponged up the water, and put the bucket again under the piping, I discover the kettle has not boiled. Neither is the microwave clock on… and I realize. The plug under the sink must have gotten hit with water! Ugh. She tells me she’ll call her electrician friend, too. Before she touches disconnect, suddenly she wonders to me if the issue is perhaps the main external drain? Thames Water is responsible for that because our property is on a shared line and it has been a problem several times before. She wants to pop by for a check. Thames Water tells the landlady they will be here within the next eight hours. A plan now in place, she leaves. I go upstairs to the office to FaceTime Dad, and we have a 15 minute chat about how drains clog, how snow is deep, that trees fall over, and that Pennsylvania is run by even bigger idiots than is New York. And I could’ve used a drink myself about now, too, I think, as my mind returns to the present. The kitchen sink is clogged. Half of the kitchen is without electric. The Mrs. – who is in central London today for a conference – is going to love this when she gets home. I’ll never hear the end of it. About 4pm, without warning the electrician turns up. He takes one look under the sink and goes into the electric box near the side door and flips a switch I had not noticed. Bingo. The electric on that stretch of wall is back. I know him reasonably well. He’s about sixty-five and has been by several times before and we’ve talked. Being an American, I learned long ago, is an immediate ice breaker here in Britain. Literally as I am watching him get into his van, Thames Water now rings on my mobile. The guy tells me he’s about half an hour away. The Thames Water guy clears the drain. Satisfied, the landlady leaves yet again. The Thames Water guy leaves not long after she does. At least Alexa had not laughed at me as all of this was going on. About an hour later, I drive over to collect the wife at the train station. I’m sensing she is doing her best to keep a straight face as I explain what has gone on since about 8am. “You’ve had some day,” she observes. Fortunately, night now intervenes. Wednesday morning, our landlady texts me that she’s found a plumber who’ll be by about midday. I know that already; he has just gotten off the phone with me. At THAT point, working on THOSE paragraphs, the doorbell rings. 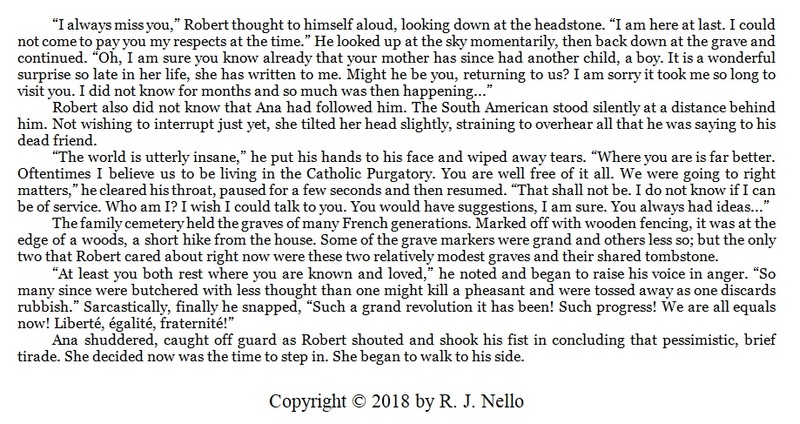 I practically hit the ceiling… immersed in writing about, you know, death – and my mind recalling the deaths of formerly quite living loved ones of my own as I do so. (And there’s more there I’m not showing you here as it will give away too much storywise.) I actually have tears in my eyes. As we’re waiting for the magic fire potion to do its thing, of course we talk. Most importantly, he cleared the sink pipe. “Panic” over. Two days.